Animal Clinic of Billings veterinarians Dr. Massic and Dr. Brown enjoying a look at a digital X-Ray of a dog confirming a wonderfully successful spine surgery. Diagnostics are critical components of veterinary medicine, and aid in the detection and treatment of illnesses. A dog with two shattered femurs repaired by Dr. Brown. The dog made a full recovery and is getting along great! As part of our diagnostic services, The Animal Clinic of Billings and Animal Surgery Clinic of Billings are equipped with digital radiography for both general and dental X-rays. We also maintain a full in-house diagnostic laboratory that is cutting edge to provide faster results with more accuracy. This helps us provide our patients with immediate and more effective treatment. Digital radiography has become the gold standard for how radiographic images are obtained. Digital radiographs (x-rays) are extremely helpful for diagnosing and monitoring many medical and surgical conditions and for examining your pet’s bones, lungs, heart, abdomen, oral cavity and other areas of the body. An x-ray can spot a fracture, detect tumors, help with the diagnosis of heartworm disease or locate an obstruction or foreign body in your pet’s intestine or stomach. When used in conjunction with other diagnostic procedures, such as barium series and ultrasound, x-rays can accurately diagnose problems, making treatment faster and easier for your pet and your veterinarian. 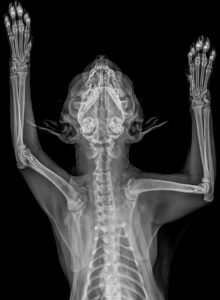 At the Animal Clinic of Billings, we offer digital radiography for both general and dental X-rays. Digital X-rays are preferred because they create significantly less radiation to the patient, and no harsh chemicals are used. The digital images produced have better clarity, are ready to view within seconds, and can be shared instantly via email. We also perform ultrasounds to help aid in the accurate diagnosis of your pet’s illness. Sometimes it is helpful for a veterinarian to visually see how your pet looks on the inside, as certain issues do not show up with bloodwork. Ultrasound is a pain-free, totally non-invasive technique that uses high-frequency sound waves to produce a real-time image of your pet’s internal organs. Ultrasound is often considered more exact than radiographs, where as radiographs show the contours and density of structures in the body, ultrasound provides a movie of what is happening inside your pet’s body. This allows for more in-depth assessment of heart problems and diseases of the abdominal organs, such as liver and kidney disorders, stomach and intestinal problems, adrenal disease, and disorders of the urinary bladder and reproductive system, as well as evaluate other areas such as the thyroid glands, testicles and mammary glands. Ultrasound can also be used to assist in collection of fluid from the abdomen for analysis, or needle biopsy samples from organs such as the liver and spleen, to aid in the diagnosis of disease. Ultrasound biopsies are minimally invasive, and have few complications compared to surgery for biopsy. However, ultrasound biopsies are very small samples; therefore in some cases surgical biopsy is more appropriate. Ultrasound also works well in conjunction with other diagnostic tools and a wide range of diagnostic procedures. For example, if an X-ray shows a lesion on your pet, an ultrasound can determine the origin of the lesion and whether it has spread elsewhere in your pet’s body. Using the ultrasound image as a guide, surgical biopsies can be obtained without major surgery and your pet can often go home the same day. Ultrasounds are typically not stressful for your pet and take anywhere from 15 to 30 minutes to perform. 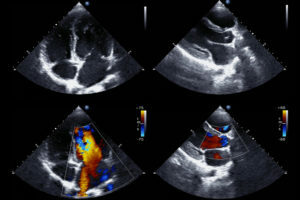 Whether it be an abdominal ultrasound or an echocardiogram, an ultrasound gives us a detailed image of various organ structures and their movement to better diagnose areas of discomfort, swelling, or infection – all in real-time! MRI’s are the newest diagnostic imaging test and the most expensive. They can cost $2,000 – $4,000. This is in part because the equipment runs as much as $1 million to buy and needs to be stored in a specially housed area to protect the rest of a hospital from its strong magnetic field. The magnet in an MRI is up to 40,000 times as strong as the earth’s magnetic field. Therefore it can ruin nearby computers and medical equipment. With that in mind, MRI’s are less harmful to a dog’s body than an x-ray because the scan doesn’t use radiation. An MRI scan magnetizes the cells of an organ while precise images are taken and sent to a computer that interprets the information. Patients lie flat on a table that slides into a domed-shaped machine that looks like a small tunnel. Your dog’s collar will be removed for the procedure to be sure there is no metal near the equipment. 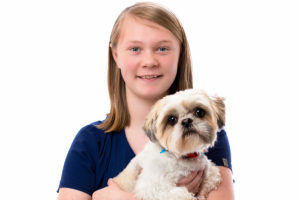 Because of the special nature of the test, we outsource all of our patients MRI’s at the Animal Clinic of Billings to a local specialty center designed for human care. This allows us to be able to afford to keep up with the most cutting edge technology and get your dog the best up-to-date care possible. The MRI procedure itself has no known negative effects on a dog. Unlike x-rays and CT scans, MRI does not use radiation. 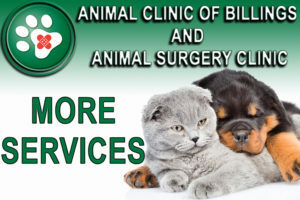 Our doctors at the Animal Clinic of Billings and Animal Surgery Clinic ensure that all of our patients going into MRI have blood work done prior to the MRI, so if there are conditions such as kidney or liver dysfunction that might increase the risk of anesthesia, they are known prior to the imaging procedure. Otherwise, MRI is considered to be a non-invasive and completely safe diagnostic tool.